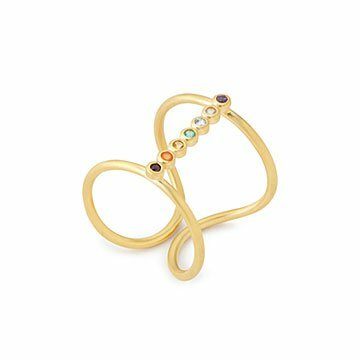 Sparkling gemstones represent the seven chakras in Satya Scainetti’s 18-karat gold-dipped ring. Imagine if your chakras, the energy centers lining your body, were made up of colorful, glittering gems. You'd be a walking rainbow. Satya Scainetti reimagines the chakras as just that in her elegant ring. She handcrafts each from 18-karat gold-dipped brass, aligning a tiny rainbow of gems down the center. It makes a thoughtful, meditative gift and reminds the wearer to stay true to their intentions no matter where the day takes them. Handmade in India. Bought this gift for a friend's birthday - was initially stumped, because she's stylish and it would be a risk to buy any type of jewelry or clothing. But when I saw that it balanced chakras, I knew it was right for her; she's been stressed and restless and the ring serves as a daily reminder to think about calming and re-balancing herself! This ring is so beautiful! I'm very happy with my purchase.